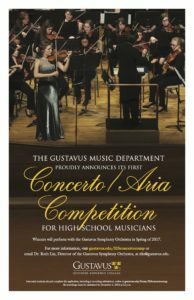 The Department of Music at Gustavus Adolphus College is pleased to announce the first Concerto/Aria Competition for high school musicians. The competition is open to instrumentalists and vocalists in high school (9-12) who are currently taking lessons. The winner of the competition will receive a Music Scholarship at Gustavus and will perform with the Gustavus Symphony Orchestra, conducted by Ruth Lin, in Jussi Björling Recital Hall on Saturday, April 22 at 1:30. Audition recordings must be submitted by December 1 along with application materials found at: 2017 Gustavus Concerto/Aria Competition. Students should select a concerto or aria written for solo instrument or voice with orchestral accompaniment approved by their applied teacher. The competition and performance time is limited to 15 minutes and the musician may choose to perform either the entire work or selected movement(s) for the competition. All finalists will receive a 30-minute lesson with a Gustavus faculty member. Students may choose to have the lesson prior to, or after the competition. Additionally, all finalists are guaranteed a Music Scholarship should he or she apply for admissions at Gustavus. The Gustavus Music Scholarships are open to all students who are interested in continuing with their musical education in college, it is NOT exclusive to students who are planning on becoming music majors. Applications and additional information on the competition process are available online at: 2017 Gustavus Concerto/Aria Competition, or by contacting Dr. Ruth Lin at rlin@gustavus.edu.